Even with the rise of digital technology, you still need some expertise to make a credible film. However, with the advent of crowd-funding, any joker with a paypal account can buy a producer’s credit. Herbert Blount is one such donor, but he will take it upon himself to finish a troubled serial killer thriller. He’ll finish it alright. 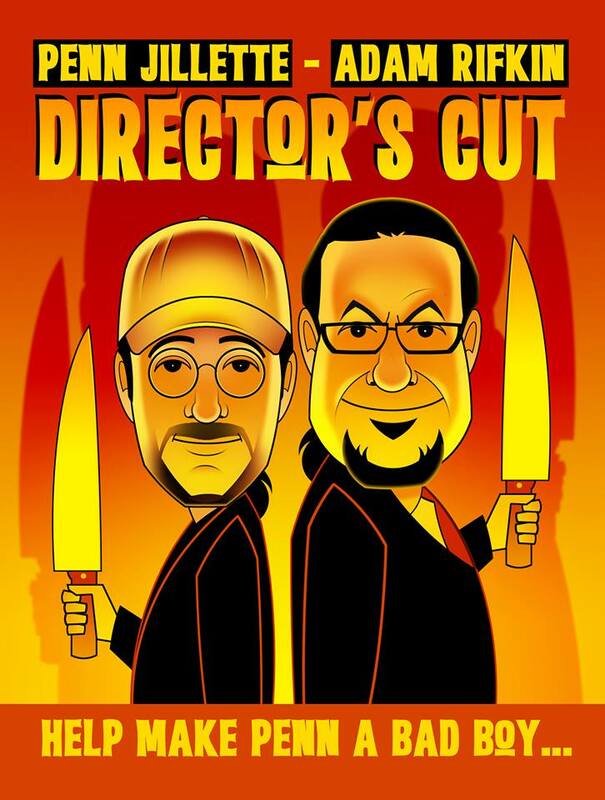 Viewers will see his final absolutely-not-studio-approved edit and hear his commentary in Adam Rifkin’s Director’s Cut (promo here), which screened at the 2016 Slamdance Film Festival. As the opening credits roll, Blount explains why Adam Rifkin’s Knock Off was initially poorly received by audiences and critics—not enough Missi Pyle. Blount clearly has a thing for Pyle that will become increasingly problematic as he starts to chronicle the behind-the-scenes chaos. He will even splice some of it in for our viewing benefit. After all, as the top crowd-funder, he bought the rights to be the making-of videographer. Harry Hamlin co-stars with Pyle as himself, Harry Hamlin, playing the misogynistic, compulsively vaping police detective Godfrey “God” Winters. Blount is convinced Hamlin is Knock Off’s weak link and he might be right in that limited respect. As the FBI profiler, Pyle must work with the sleazy Hamlin and Hayes McArthur playing himself playing Winters’ partner Reed. In the film, they are directed by the harried Adam Rifkin, while in the film-with-the-film, they are bossed around by their lieutenant, played by Lin Shaye, in an inspired bit of casting. About ten minutes into the film, Blount gives us a strong indication he is a bit off the rails when he installs spy cameras in Pyle’s room. Of course, his behavior will only get more erratic. 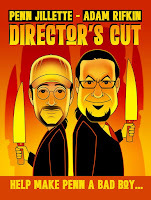 Just for the record, Director’s Cut was itself crowd-funded, but it sure doesn’t seem to think much of the practice. Whether it be Blount invading Pyle’s space or Rifkin mailing out t-shirts, the film just doesn’t make fundraising strategy look like it is worth the hassles. You have to give Hamlin and his wife Lisa Rinna credit for poking fun at their celebrity images. However, nobody is a better sport than Pyle, who soldiers through all sorts of embarrassing situations and allows the film to remind the world she was in A Haunted House 2, with Hayes McArthur. Rifkin shows some nice comedic timing of his own. Yet, Penn Jillette dominates every second with his in-character, relentlessly un-self-aware narration and his larger-than-life, uncharacteristically unsettling presence. Penn & Teller Get Killed knows Jillette is the sort to go for broke on the big screen—and Director’s Cut is no exception. It is funny and sometimes acerbically insightful, but Rifkin and Jillette get a bit bogged down during the endgame. Still, whenever this much self-referential humor is offered in such questionable taste, no self-respecting cult film fan should pass it up. Recommended for fans of Penn & Teller and the films of Kirk & Rodney Ascher, Director’s Cut just had its world premiere last night at this year’s Slandance in Park City, Utah.